Being ready for an emergency in Louisiana is essential. 2theadvocate is dedicated in providing you the latest information to be better prepared for an emergency situation. We continuously strive to improve the preparedness and protection of Louisiana residents and visitors by providing all emergency preparedness contact numbers and hurricane and weather maps. We do this through mutiple sources that we find will be the most useful. We also have a free emergency checklist that can be downloaded. Be safe! Obtain or build an emergency kit & make a family communications plan. Learn the elevation level of your property & whether the land is flood-prone. This will help you know how your property will be affected when storm surge or tidal flooding are forecasted. Identify levees & dams in your area & determine whether they pose a hazard to you. Learn community hurricane evacuation routes & how to find higher ground. Determine where you would go & how you would get there if you needed to evacuate. Cover all of your home’s windows. Permanent storm shutters offer the best protection for windows. A second option is to board up windows with 5/8” marine plywood, cut to fit & ready to install. Tape does not prevent windows from breaking. Be sure trees & shrubs around your home are well trimmed so they are more wind resistant. Clear loose & clogged rain gutters & downspouts. Reinforce your garage doors; if wind enters a garage it can cause dangerous & expensive structural damage. Plan to bring in all outdoor furniture, decorations, garbage cans & anything else that is not tied down. Determine how & where to secure your boat. What do I do if a hurricane is on its way? Check your disaster supplies (Emergency Checklist). Replace or restock as needed. Close your windows, doors & hurricane shutters. If you do not have hurricane shutters, close & board up all windows & doors with plywood. Turn your refrigerator & freezer to the coldest setting. Keep them closed as much as possible so that food will last longer if the power goes out. Create a hurricane evacuation plan with members of your household. Planning & practicing your evacuation plan minimizes confusion & fear during the event. Find out about your community’s hurricane response plan. Plan routes to local shelters, register family members w/ special medical needs & make plans for your pets to be cared for. Obey evacuation orders. Avoid flooded roads & washed out bridges. Download App to your smartphone that can notify people where you are, & if you need help or are safe. The Red Cross has a Hurricane App available in the Apple App Store & the Google Play Store. A First Aid App is also available. Download Getagameplan App to identify places to evacuate, including for pet shelters & special needs. Visit www.getagameplan.org for more information. Use hurricane shutters or board up windows & doors with 5/8 inch plywood. Go over the evacuation plan with the family, & learn alternate routes to safety. Evacuate if ordered & stick to marked evacuation routes, if possible. Store important documents: passports, Social Security cards, birth certificates, deeds in a watertight container. Have a current inventory of household property (advised to take pictures). Unplug small appliances & electronics before you leave. If possible, turn off the electricity, gas & water for residence. Standard homeowners insurance doesn’t cover flooding. It’s important to have protection from the floods associated with hurricanes, tropical storms, heavy rains & other conditions that impact the U.S. For more information on flood insurance, please visit the National Flood Insurance Program Web site at www.FloodSmart.gov or call 1-888-379-9531. Secure your home, close storm shutters & secure outdoor objects or bring them indoors. Turn off utilities if instructed to do so. Otherwise, turn the refrigerator thermostat to its coldest setting & keep its doors closed. Move your boat if time permits. Ensure a supply of water for sanitary purpose such as cleaning & flushing toilets. Fill the bathtub & other larger containers with water if you haven't yet. Find out how to keep food safe during & after an emergency. If you are unable to evacuate, go to your wind-safe room. If you do not have a wind-safe room stay indoors during the hurricane & away from windows & glass doors. Secure & brace external doors. Keep curtains & blinds closed. Stay alert for extended rainfall & subsequent flooding even after the hurricane or tropical storm has ended. Drive only if necessary & avoid flooded roads & washed out bridges. Keep away from loose or dangling power lines & report them immediately to the power company. Inspect your home for damage. Take pictures of damage, both of the building & its contents, for insurance purposes. Avoid drinking or preparing food with tap water until you are sure it’s not contaminated. (If you have the slightest doubt about the water's safety for drinking you can either boil for 10 minutes and pour between containers to replenish oxygen, add eight drops of plain liquid chlorine bleach per gallon & wait four hours, or add water urification tablets per manufacturer's instructions. Wear protective clothing & be cautious when cleaning up to avoid injury. Watch animals closely & keep them under your direct control. Make sure that your children are not playing in flood water. If your community has experienced a disaster, register on the American Red Cross Safe & Well website to let your family & friends know about your welfare. You may also call 1-866-GET-INFO to register yourself & your family. Some of the recommendations listed above were provided by American Red Cross & FEMA. Mitigation is the effort to reduce loss of life and property by lessening the impact of disasters. Mitigation is taking action now—before the next disaster—to reduce human and financial consequences later (analyzing risk, reducing risk, insuring against risk). Effective mitigation requires that we all understand local risks, address the hard choices, and invest in long-term community well-being. Without mitigation actions, we jeopardize our safety, financial security, and self-reliance. Roof's catch the brunt of wind and wind driven rain. Reinforce your roof's framing connections from the rafters to the foundation to hold together in the face of storms. The most common technique involves installing anchor bolts and metal plates and straps to strengthen connections. Roof straps, also known as hurricane straps, more firmly affix the house’s roof to load bearing walls, resulting in the roof being less likely to blow off in high winds. Straps, rather than clips, should connect wall framing to each rafter or truss. Install in correct. Many roofing failures occur because the shingles are not installed properly. Something as simple as using all the required nails in a shingle or the addition of roof straps can make a big difference. The building code requires that windows be protected from flying debris when the building is located in an area where the design wind speed is 120 per hour or greater. Using impact resistant windows or covering the windows with impact resistant shutters can provide protection. Adding window protection is not required, it’s just better to be safe than sorry. Elevation becomes a requirement when a building in a flood prone area has been substantially damaged or is being substantially improved. Substantially damaged or improved is defined by the Briggert-Waters Act of 2012 as when the cost of the improvement equals or exceeds 30 percent of the market value of the structure before the “start of construction” of the improvement. Building codes are put into place to help you build safer, stronger, and smarter. For better protection, use code requirements for higher-risk zones. This can help protect your home or business from future hazards. Ask your developer, contractor, or local building code official to help you identify the risks your home or business may have, as well as mitigation techniques that provide extra protection. Lousiana has adopted International Residential Code (IRC) 2009 and uses this as the residential building code standard. FEMA's Federal Insurance and Mitigation Administration (FIMA) manages the National Flood Insurance Program (NFIP) and implements a variety of programs authorized by Congress to reduce losses that may result from natural disasters. 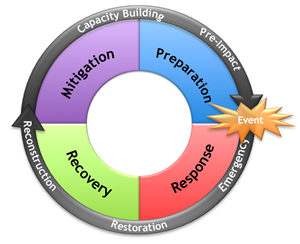 Effective mitigation efforts can break the cycle of disaster damage, reconstruction, and repeated damage. FEMA's mitigation and insurance efforts are organized into three primary activities that help States, Tribes, Territories, and localities achieve the highest level of mitigation: Risk Analysis, Risk Reduction, and Risk Insurance. Through these activities and FEMA's day-to-day work across the country, communities are able to make better mitigation decisions before, between, and after disasters. Using corrosion-resistant hardware in areas prone to storm damage. In coastal environments, using connectors made of double-hot-dipped galvanized or stainless steel for best protection. Ensuring you or your contractor follows the manufacturer's installation instructions for any materials used in new home construction, repair, or renovations. The Saffir-Simpson Hurricane Wind Scale is a 1 to 5 categorization based on the hurricane's intensity at the indicated time. The scale – originally developed by wind engineer Herb Saffir and meteorologist Bob Simpson – has been an excellent tool for alerting the public about the possible impacts of various intensity hurricanes1. 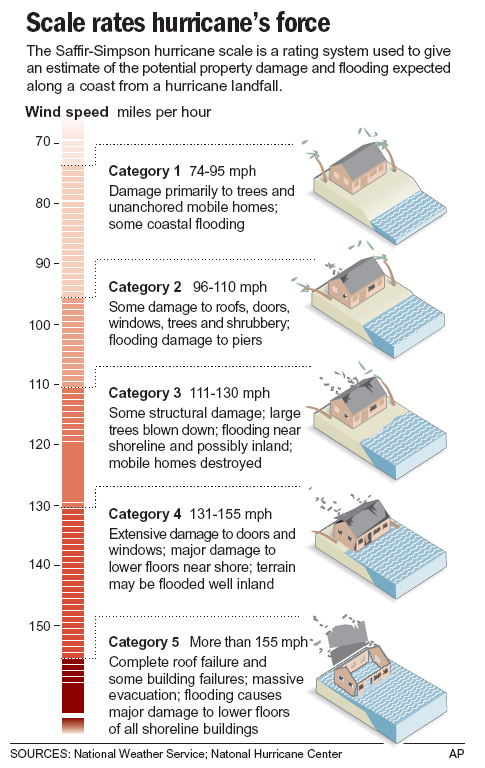 The scale provides examples of the type of damage and impacts in the United States associated with winds of the indicated intensity. In general, damage rises by about a factor of four for every category increase2. The maximum sustained surface wind speed (peak 1-minute wind at the standard meteorological observation height of 10 m [33 ft] over unobstructed exposure) associated with the cyclone is the determining factor in the scale. (Note that sustained winds can be stronger in hilly or mountainous terrain – such as the over the Appalachians or over much of Puerto Rico - compared with that experienced over flat terrain3.) The historical examples provided in each of the categories correspond with the observed or estimated maximum wind speeds from the hurricane experienced at the location indicated. These do not necessarily correspond with the peak intensity reached by the system during its lifetime. It is also important to note that peak 1-minute winds in hurricane are believed to diminish by one category within a short distance, perhaps a kilometer [~ half a mile] of the coastline4. For example, Hurricane Wilma made landfall in 2005 in southwest Florida as a Category 3 hurricane. Even though this hurricane only took four hours to traverse the peninsula, the winds experienced by most Miami-Dade, Broward, and Palm Beach County communities were Category 1 to Category 2 conditions. However, exceptions to this generalization are certainly possible. The scale does not address the potential for other hurricane-related impacts, such as storm surge, rainfall-induced floods, and tornadoes. It should also be noted that these windcaused damage general descriptions are to some degree dependent upon the local building codes in effect and how well and how long they have been enforced. However, for a long time to come, the majority of the building stock in existence on the coast will not have been built to higher code. Hurricane wind damage is also very dependent upon other factors, such as duration of high winds, change of wind direction, and age of structures. PARISH EMERGENCY OPERATIONS CENTER: The facility that provides coordination and contrl of all emergency response and receovery activities for the Parish during declared emergencies. EMERGENCY ALERT SYSTEM: A state-of-the-art digital system designed to give emergnecy Information and instructions from Federal, State, and local authorities. The system is interfaced with the cable television system as well as radio and television stations. When activated, it broadcasts the latest information on weather reports, road conditions, evacuations, shelter locations, reentry information. EVACUATION ORDER: The most important instruction you will receive from local government officials. When appropriate, the State of Louisiana Evacuation Plan goes into effect. 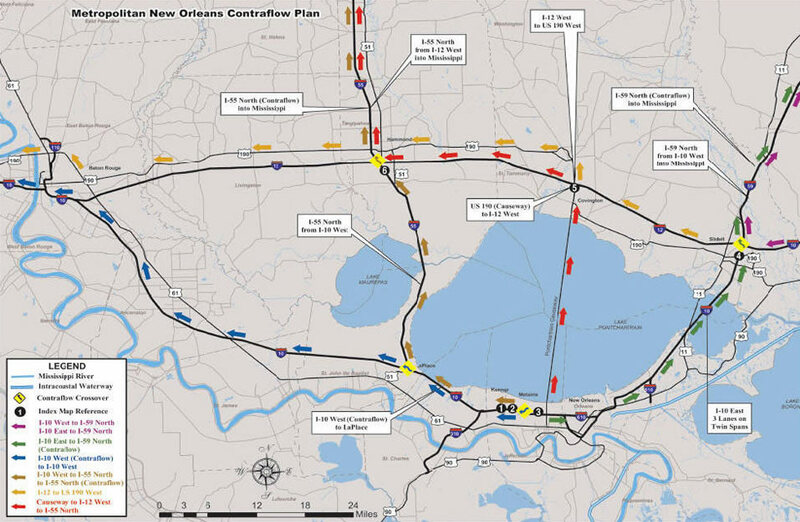 This plan may require, depending on predicted impact, the evacuation of everyone in south Louisiana in vulnerable areas. EYE: The low-pressure center of a tropical cyclone or hurricane. Though the most intense area of the storm surrounds it, winds are normally calm and sometimes the sky clears. EYE WALL: The ring of thunderstorms that surrounds a storm’s eye. The heaviest rain, strongest winds and worst turbulence are normally in the eye wall. FLASH FLOOD: A flood that occurs within a few hours (usually less than six of heavy o excessive rainfall or dam or levee failure. GALE: Sustained wind speeds from 39 to 54 mph. HURRICANE: A severe tropical cyclone with sustained winds over 74 mph. KNOT(s): Unit of speed used in aviation and marine activities. One knot is equal to 1.15 mph. STORM SURGE: A rise of the sea level along the shore that builds up as a storm (usually a hurricane) moves over water. It is a result of the winds of the storm and low atmospheric pressure. STORM TRACK: The path that a low-pressure area follows. TORNADO: A violently rotating column of air classified into three min groups; weak – wind speeds up to 110 mph; strong – wind speeds into 100 to 205 mph; and violent – wind speeds 205 to perhaps 320 mph. TROPICAL OR SUBTROPICAL DEPRESSION: Cyclones that may have maximum sustained winds of 38 mph or less. These are referred to as low-pressure systems in public advisories and statements. TROPICAL STORM: Tropical cyclone that has maximum sustained winds from 39 to 73 mph. WARNING: Issued when a particular weather or flood hazard is “imminent” or already occurring (e.g., tornado warning or flash flood watch). A warning is used for conditions posing a threat to life or property. WATCH: Forecast issued in advance to alert the public of the possibility of a particular weather-related hazard (tornado watch, flash flood watch). It is intended to provide enough lead time so those who need to set their plans in motion can do so.